Industry experts predict that successful businesses will soon become 100% digital for all transactions. 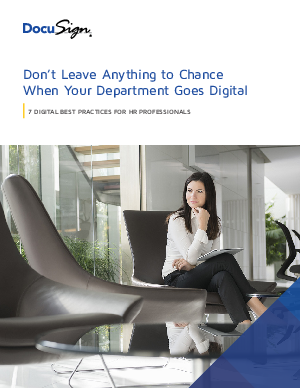 The challenge is how to “go digital” in the right ways. For many companies, it will be an incremental journey. The HR world is changing quickly—global candidates are tech-savvy and are relying on mobile-enabled interactions. Now more than ever, HR teams are looking to improve the onboarding experience, increase employee satisfaction, and focus HR staff away from mundane tasks. This best practices paper outlines seven important ways that HR teams can make meaningful progress in their digital transformations.